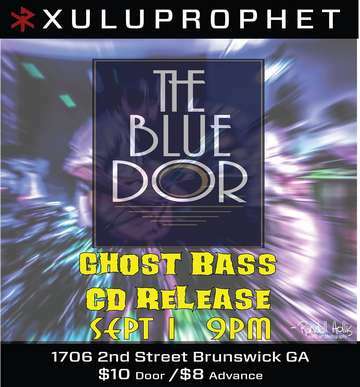 Xuluprophet double release is going down at Live at the Blue Door Labor Day weekend.The boys will be releasing 1/2 of the double release in Brunswick. Second 1/2 will be released in Savannah. Xuluprophet will again delve into the sound-waves out in the ocean of time to bring you a otherworldly music experience. Xuluprophet is a Psychedelic Funk/Reggae/Rock Jam Band out of Savannah, GA, a veritable phenomenon of high octane, groove laden PARTY music.Founded in 2013 by Irish guitarist/producer Oisin Daly and South Bronx native songwriter Xulu Jones as an acoustic 2 piece brought together by their mutual love of Reggae and Jimi Hendrix. Soon they added a drummer and eventually switched to electric guitars. A unique setup allows each guitarist to switch between bass and guitar live on stage which adds a fluid dynamic to the performance. Now a power trio with Rhett Coleman on Drums, Xuluprophet has recently shared the stage with The Wailers and Passafire as well as headlining multiple festivals regionally. The groove heavy rhythmic style has its roots in carribean and latin rhythms while the dual guitarist sound has shades of 60's psychedelia, 70's funk, 80's rock and 90's grunge. They have been compared to artists as varied as The Police, Jimi Hendrix, The Cure, Bad Brains and Primus. Playing mostly dance and party music, the lyrical message is both political and spiritual, drawing from their Reggae roots they wish to influence the listener to reflect and better themselves and the world around them through the power of music and song. Be sure not to miss this unique and dynamic live band!